Most song lyrics demand to be listened to in context, not read in isolation on the page. When I talked to Hamilton Leithauser—lead singer of the acclaimed, now-defunct rock band The Walkmen—he used a favorite line from Elvis Presley’s “All Shook Up” to illustrate how he thinks about the interplay between words and music, and why it’s important to balance instinct and rationality in the creative process. The two final Walkmen albums featured spare, ascetic songs, with arrangements you could pull off on a four-track. But on his recently released solo debut, Black Hours, Leithauser trades self-imposed leanness for songs fleshed out with marimba, conga, handclaps, even a few backing “shoo-bee-do-wahs.” As the opener, “5 AM,” explicitly channels Sinatra, complete with cinematic Gordon Jenkins strings, you can hear a singer making a compelling case for a place among the great vocalists of American music. Hamilton Leithauser spoke to me by phone. Hamilton Leithauser: I’ve listened to Elvis my whole life. My mom always played his records when I was growing up, so I got started on him early. Once you get into The Beatles, The Stones, and Bob Dylan, you realize that they all saw Elvis as their hero, and that brings you back. Later, in high school, I was listening to lots of rockabilly punk—bands like The Cramps, who reference Elvis over and over again. With so many kinds of music you’re going to find your way back to the King pretty quick. He’s got charisma, style, voice, the whole shooting match. There’s an energy, rawness, and purity to his music, whether he’s doing fast songs or slow ones. He’s a guy to return to, again and again, for me. I’m itching like a man on a fuzzy tree. Now, this might be one of the 10 most famous songs ever recorded—so you don’t really question the words as you listen. But when you look more closely, it’s a funny line. What’s a “fuzzy tree?” Why would somebody be stuck in one? It’s a strange image, especially compared to the other verses, which are much more conventional. Lines like “My hands are shaky and my knees are weak / I can’t seem to stand on my own two feet” are much more straightforward, closer to what we’d expect in a love song. At the same time, though, it really works. The line’s playful, nonsensical tone works for the “shook up” narrator, who seems like he’s been driven into a frenzy by desire. I mean, I’ve got allergies—I can relate to that itchy, agitated state he’s talking about. The image gets your skin going, and the way Elvis sings gets you going. The sound of the words is perfect, too—they’re great to sing along to, they roll off the tongue. For these reasons, the words work within the context of the song—even though, alone on the typed page, they might fall a little flat, or make you scratch your head. They’re nonsense, and they’re not, at the same time. Though I love songwriters whose lyrics can stand alone, people like Bob Dylan or Leonard Cohen, I can’t separate my words and music—the same way you can’t really separate the lyrics of a song like “All Shook Up” from its musical context. I’ve tried to write out stanzas first and set music to them later—I think it would be fun to work that way. When the music supports the lyrics, you can start focusing less on the melody—there’s not so much weight on every note to get across what you’re trying to express. But that approach just doesn’t work for me. The stuff I write isn’t poetry. The words serve the song, and not the other way around. 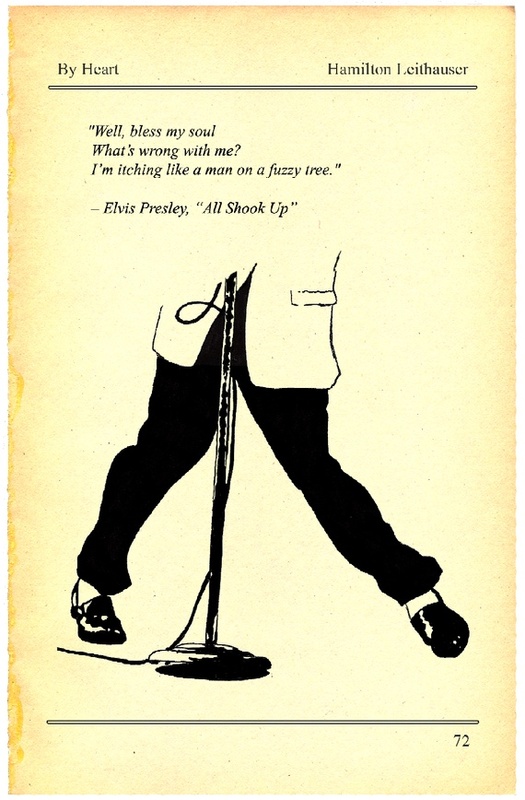 For me, “All Shook Up” demonstrates the challenge of writing lyrics the way I do: You’ve got to balance what works for the song with a desire to have things make sense, hang together, check out intellectually. Because the lyrics I write serve the music first and foremost, and work as language second, I have to be willing to privilege sound, phrasing, and intonation over literal meaning. I have to be willing to say something like “fuzzy tree,” if that’s the right thing for the song, even when I’m not fully sure what it means. But then, you can’t write just anything. Without some kind of center, even if you have a bunch of lines that sound good, it’s not much more than rambling nonsense. The lyrics have got to be grounded somehow—ideally, they form some kind of cohesive whole. So, it’s better when you have a subject of some kind: This will be a love song, maybe, or this will be addressed to a certain person. Even a phrase can be enough to hang a song on, lyrically—on the new record, the phrase “I retired” helped set the tone for the rest of that song’s lyrics. I need something that’s going to be the centerpiece of the song—a name, or theme, or idea. A small, guiding idea can be enough to have the lyrics come together. Once I have that, the rest will fall into place. So, lyric-writing tends to balance intuition and rational thinking. For instance, the song “Angela Surf City” by The Walkmen: Well, I don’t know anyone named Angela, and honestly, I didn’t want to sing the song that way. But for some reason, that opening line came to mind—and it was the approach that worked. I tried a million other things, but everything else I put in there was so much lesser. I just had to make peace with the fact that the lyrics were nonsense, spontaneous, even ugly-sounding—but they served the song. It’s an ugly beginning to a song, but I had to let that go. The guitar, vocals, and the drums all start the song in a very abrasive way. And the lyrics, “Angela / Holds a grudge / Over nothing,” capture that feeling. That’s what that song needed to be. At first I was going to try to use my daughters’ name, Georgiana, but the word didn’t sound right for the song. “Alexandra” and “Georgiana” have same syllables, and both are women’s names–so why did Alexandra just seem to fit the song, when my daughter’s name didn’t? I don’t know. There’s something in the sound of the word, and in the way it feels to sing it, that just captures what the song is. I felt strange about it: Am I going to just use a random girl’s name? But fighting it was pointless. It fit the melody, it worked syllabically, and the word’s sound had the right feel. So that’s what it took. In the end, I had to ask myself—if it’s working, why bother fighting it? There’s a certain kind of trust you have to have in the spontaneous choices you make sometimes—to accept the words that suggest themselves because they seem to hold the emotion somehow, even when you’re not sure why. It’s so easy to get lost in that tunnel vision. You can get so lost intellectualizing something, when the answer is right in front of your face. You reach a point when you start to think, why am I doing this, obsessing over one small detail at the cost of the song? When it stops being fun, it’s a sign you’ve crossed a line. For me, songs start with the instruments—usually guitar parts or piano—and then the melody follows. I obsess over melodies, I really do—I’ll try many different melodies for every song. Sometimes that’s a good thing, and sometimes it’s not. As with anything, you can overthink it. You can work it way past the point where it should have worked—then end up deleting the whole thing, months of work, when you realize the first thing you tried is still the best. But it never works the same way twice. Sometimes, all that striving does pay off. But it’s harder to be spontaneous with lyrics, because you can’t really improvise the words to a song. I think that’s why words are so difficult to write—most of the time I spend working on a song is trying to get the lyrics right. Occasionally, I’ll write a song where I write the lyrics and the music at the same time—and usually, that’s the best stuff you write. You’re grateful because then you don’t have to slave away on it. But most of the time, I have to really work to get the words to capture the spirit of the music. It’s difficult to make it all part of a cohesive whole, to find the words that capture the feeling of the wordless instruments. I have a new song right now that I love. The words and melody came fast, together, at the same time—but only for half the song. So I have half a song sitting there. I’m so excited to work on it, but everything I do to try to complete the song ends up making it lesser. Everything I’ve tried since that first burst of writing, I’ve deleted. When I add words to what I had, it dilutes the original burst of inspiration. When I try to go anywhere with the melody, nothing’s adding to it. I think the song’s fantastic, but I haven’t figured out how to finish it. Usually, you have to forfeit a little something. If you’ve been planning it for a long time as I have for this one, something’s going to have to give. You have to lose something to get farther. Maybe the final result isn’t necessarily what you were hoping for, or setting out to do. But if you can be willing to roll with the punches, and deal with some unexpected turns, you can end up with something you’re pleasantly surprised by. It’s a puzzle, and you have to be willing to throw away your favorites and go with what’s working. When you’re working in a band, it gets even harder. They have their favorite things, too—if it’s not a lyric, it might be an instrumental part. But what if their favorite part doesn’t jive with the part you want? That’s where the drama unfolds. The songs that provide the biggest challenges are often the ones that didn’t work out. For this record, I didn’t have too many songs that died—but the ones that didn’t make the record, or the deluxe version, are ironically the ones I spent the most time on. The songs that do make my records tend to be the ones that feel like they’re working—you spend a lot of time on them, but it’s all productive time. It’s not bashing your head against a wall. If you have to fight the song too much, it’s likely it won’t make the cut. Occasionally, though, there’s a performer who can make almost anything work. And Elvis was one. Take another one of his most famous songs, “Heartbreak Hotel.” Elvis didn’t write the song—but, according to legend, he arranged it and produced it, even though another guy’s name was listed as producer. The thing is, it’s not that remarkable a song without everything Elvis is bringing to the table. Without his arrangement, his production, and his singing, it would be a fairly typical 12-bar-blues. “Well since my baby left me, I found a new place to dwell”—not the world’s most striking lyrics. But it doesn’t matter, because his delivery is so incredible. The style, the emotion, the absolutely magnetic charisma makes the song irresistible. At his best, Elvis could sing almost anything—and I’d want to listen.